The care we provide is free of charge, but we rely on our local community for donations in order to continue to provide our services. We provide our services free of charge, but only 20% of our £4.2million-a-year running costs are funded by the NHS – leaving us to raise the other £3.374million we need each year. So, how do we raise that money? Our hard-working retail and fundraising teams work with our community to organise fundraising events and to encourage individuals, local businesses and other trusts and organisations to make donations. The wonderful support we receive from those in our community – whether they’re organising their own event, getting their workplace, school or local clubs involved, or participating in one of our events – means we can continue to provide much-needed support to hundreds of local people. We also have more than 700 volunteers supporting the hospice across 40 different roles. 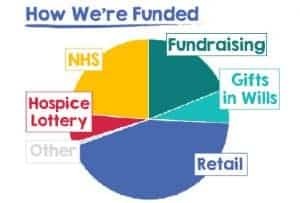 Their dedication and support saves the hospice money, allowing us to focus our spending on providing care and support to local people affected by life-limiting illnesses.